Mangaluru, Jan 31, 2019: Country boat fishermen have begun their dharna in front of the office of the Deputy Director of Fisheries at the old port here on January 31, Monday demanding steps to prevent fishermen from resorting to light fishing and bull trawler fishing. 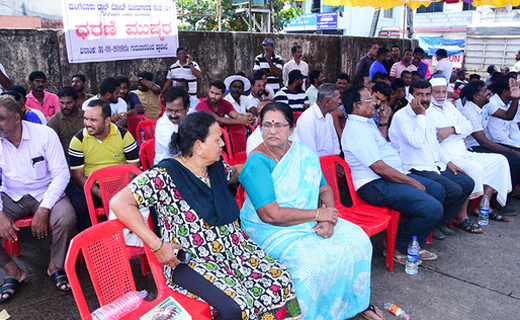 The protest has been organised under the aegis of Mangaluru Trawl Boat Fishermen’s Association. The protestors said it was condemnable on the part of some fishermen to resort to light fishing and bull trawl fishing in contravention of rules. They also urged the authorities to take steps to end the impasse. Association President Nitin Kumar, Vice President Abbas Haji, General Secretary Rajesh Ullal and other office bearers and members are participating in the dharna.